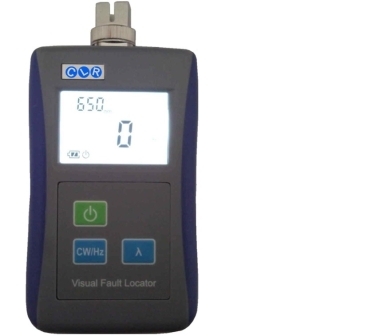 CLR-VFL-SC10 Visual Fault Locator is a visible red light source for finding breaks and tight bends in optical fiber cables. The CLR-VFL-SC10 generates red laser and this visual red light that is escaping from optical fibers makes it easy finding broken points in the lines, verifying continuity, checking the validity of patch cables or looking for cracked fiber in splice cases, bad connectors, tight bends in fiber cable. CLR-VFL-SC10 also has a LED screen on which the battery level and wavelength are displayed.